Sustainable sourcing is just one of many reasons why you should use Hemlock timber in your next project. Recommended for any internal or out-of-weather space application, Hemlock is a naturally beautiful timber species that delivers a contemporary appeal for an affordable price. The perfect addition to any interior space, Hemlock makes an impressive architectural statement, and is an abundant, workable timber. A premium quality timber at an affordable price, Hemlock boasts a smooth and consistent surface with a fine-lined grain that creates an excellent impression at first sight. Hemlock is traditionally light blonde in colour; however, Austratus offers a selection of contemporary shades to suit every design project. Each shade finishes beautifully, and can be sanded to create a silky, reflective effect. Hemlock panelling stays true to its natural beauty and ages gracefully. One of the strongest softwoods, Hemlock offers great resistance to scratching, marring, and general wear. The timber grows harder with age, with no warping or twisting. Its resilience, comparable to that of more expensive timber species, makes it a sensible choice for interior design projects. Hemlock is a highly versatile timber that allows architects the flexibility to create unique and expressive spaces. The timber easily accepts paint, stain, and clear finishes with exceptional results. Hemlock’s incredible response to a variety of coatings means Austratus can work closely with architects to customise design projects and achieve any desired finish. Hemlock timber is easy to work with, delivering several advantages during the application. The timber responds well to planing and moulding, and can be screwed or nailed without splitting. Hemlock can be machined with precision, an attribute that allows you to achieve the intricate details of your project seamlessly. Hemlock’s stiffness and high bending strength ensures excellent performance and longevity. 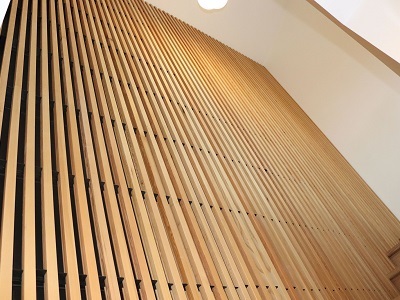 Austratus’ Hemlock timber is used for suspended ceilings, timber ceilings, feature walls, and screens.